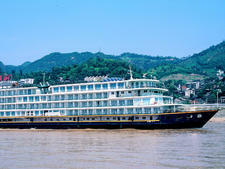 Every river has distinctive passenger vessels that ply its waters. Think of the Mississippi and you probably think of paddlewheel steamboats. Picture the Rhone or Loire and you're likely to imagine slow moving, low-slung barges. Travel posters for the Rhine show river steamers passing in front of medieval Germanic castles. But ask an American about the Yangtze River and they're likely to draw a blank. 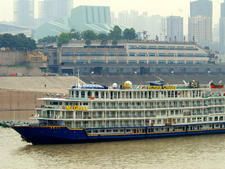 Until recently the Yangtze -- and all of China, for that matter -- has been an inscrutable mystery for Westerners. 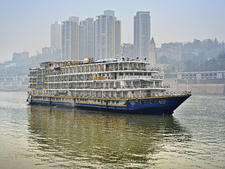 To be sure, there are literally hundreds of river cruisers sailing the Yangtze, but for the past ten years only one company has been conducting cruises aimed specifically at American travelers. 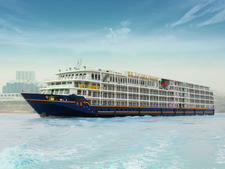 That company is Victoria Cruises, and their most recent build is 2004's Victoria Katarina. 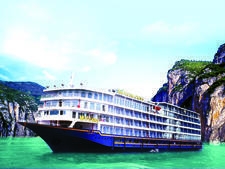 Like other river cruises, Katarina's Yangtze itineraries feature more sailing time during daylight hours than open sea cruises to maximize viewing the constantly changing tableau of cities, rice paddies and dramatic gorges that make up living backdrop of the banks of the Yangtze. Service is exceptionally personal. Like most Chinese, the crew of Katarina seem honestly friendly toward, and curious about, Americans. Granted, there is the occasional language impasse, but this is more than made up for by the warmth and care lavished on Katarina's guests. By way of example, on the day after a night-long downpour we returned to the ship after slogging through mud-choked streets. Upon our return, an announcement on the ship's P.A. system asked us to leave our shoes in the hallway outside our cabins when we went to lunch. When we returned to our cabins after the noontime meal we found that every passengers' shoes had been cleaned and returned. By and large, well-traveled, 50+, with about 60 percent Americans, 35 percent from Europe, Australia and Taiwan, 5 percent from Mainland China. Casual during the day, with clothing weight dictated by time of year. 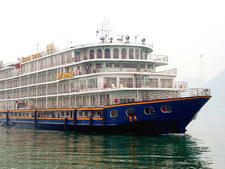 There are generally two "formal" nights per cruise, the captain's Welcome Aboard reception and the Farewell Dinner. Formal, on this ship means jacket and tie for men, equivalent for women. Suggested tips are $5 to $7 per person/per day, put in a single envelope and placed in a tip box in the reception area at the end of the cruise.